Black Motor, a tough minded sax, bass and drum trio and trumpeter Verneri Pohjola, both from Finland, are new discoveries for me. Rubidium may mark their first release together, but without knowledge of their previous and separate works, all I can say is that it seems like a natural pairing. Verneri Pohjola has worked with Helsinki based UMO Jazz Orchestra, the Orkestrova, as well as his own groups and Black Motor has been together for the better part of a decade with seven other albums under their belt. The group has been described in some press materials as playing "uncompromising free jazz in the spirit of their early idols, Albert Ayler, Peter Brötzmann and Rashied Ali, combined with more traditional forms of jazz expression." While the music feels a bit less raw than the influences mentioned above, there is indeed a fine and free spirit of improvisation and exploration exuding from the recording. The mix of structure and freedom makes the quartet's music seamless and fresh. For example, the treatment that the group gives to Nikolai Rimsky-Korsakov's 'Song of India' has a more traditional head/solo set up, but Sami Sippola's sax often pushes the tunes to the edges of tonality without ever going over it. Pohjola's solo devolves into an exchange between bassist Ville Rauhala and drummer Simo Laihonen, whose support is essential: beautifully flowing bass lines and pulsating percussion allow the two horns great freedom. The title track 'Rubidium' begins with unison melodic lines, subtly arresting harmony and features some fierce group improv. A real highlight though comes in the three minutes of 'Sax-o-Phun' where Sippola lets out his inner Brötzmann, breathes fire, and then segues into a climatic old-timey jazz fanfare. A powerful arrangement of Edward Vesala's 'Kynnyspuulla' provides a little gravity to the end of the album. 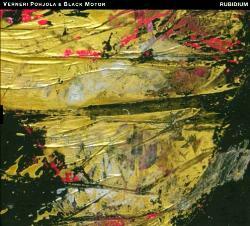 Verneri Pohjola & Black Motor have created an album that is powerful and subtle, and serious but playful. It's well worth a deep listen.